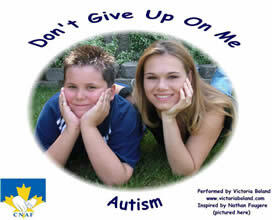 On April 30, 2006 the new Autism Song "Don't Give Up On Me (Autism)" was released by Victoria Boland for the Canadian National Autism Foundation. "Don't Give Up On Me (Autism)" is an original song that was recorded by Hamilton artist Victoria Boland and co-written with her mother; Viga Boland, specifically for the Canadian National Autism Foundation. Listen to a radio interview of Tina Fougere, President and Founder of Canadian National Autism Foundation on CKLQ 880 in Manitoba on August 21, 2006. Boland (CA), it was just released this month (October 2006)!! !